My year of getting published: Interview with a Travel Writer...Anja Mutić. Interview with a Travel Writer...Anja Mutić. 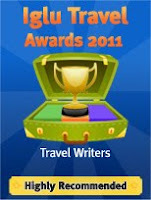 Hi Anja and welcome to Write To Travel. Thanks for stopping by for a chat. I started writing very early on. My first project, when I was seven, was an illustrated book of stories about adventures of three farm animals who set out together to explore the world. Then came a slew of short stories, several unfinished novels, poetry, spoken word... Travel writing was something that only happened in the last six years, after several moves across continents and frequent trips made it the most obvious – and desired – profession for me. After working as an online editor for RoughGuides.com for a couple of years, my “break” was hitting the road for my first on-the-ground project, a five-week trip to Bolivia to research the Rough Guide to South America. I had never been to the country before, so I was excited and nervous at the same time. Once I got there, I think I was running on adrenaline (and the thin air of the Andes) the whole time. It was an amazing and incredibly challenging experience, tackling a country that’s politically so volatile, difficult to travel around (the rainy season was just starting when I arrived), and culturally so many worlds apart from anything I knew up until that point. It was enlightening, humbling, and inspiring. Travel with an open mind, get off the beaten trail, be prepared to rough it and improvise, take notes (even if it’s just one sentence a day, about the color of the sky or the taste of the dish you’re eating), and always be on the lookout for interesting details. It’s often the least obvious things that make the most compelling travel stories. When I pitch articles these days, I find the editors bite most for offbeat angles. You can whip up a destination guide pretty easily using your own notes plus the wealth of info available online. What’s more of a challenge is coming up with a story that has an unusual angle, a twist, a sense of surprise. Whenever you take a trip, and even when you’re walking around your own neighborhood, seek out what’s beneath the surface. Starting your own blog is a great way to share your travel observations and tips. Printed media, particularly the world of guidebooks, is tricky because information becomes outdated so fast. The process of on-the-ground fact-checking – and so much of guidebook writing is exactly that - is truly laborious yet can become obsolete overnight. A cafe I check out for a guidebook in, say, Lisbon, may shut down in two months as the book has already gone to press. I’d say online is the way to go if you want fresh information. What I see as a much better fit for printed media are travel narratives. Personally, I much prefer holding an actual book and reading an engaging travel story than doing it online. Of the contemporary travel writers, I probably enjoy Pico Iyer’s writing the most. But, I’ll admit, I don’t read travel literature often enough. The literature of exile, however, is something that has always been like a magnet for me, probably because I myself have been living in self-imposed exile from my home country (Croatia) since 1993. I believe the literature of exile is in some aspects like travel literature. It’s about being placed (in the case of exile) or placing yourself (in the case of travel) outside of the regular context of your life and having to deal with whatever life throws at you. A book I’d highly recommend is Letters of Transit: Reflections on Exile, Identity, Language and Loss, which has essays by poet Charles Simic, novelist Bharati Mukherjee etc. 6. As a writer and traveler, what are the biggest challenges you face on the road? My biggest challenge as a travel writer is keeping certain places and experiences ‘sacred’ by not writing about them. I’ve been to many spots around the world that were so special that I made a conscious decision not to place them on the tourist map. There was a samba bar in Rio, a clandestine restaurant on an island in Croatia, a beach community without electricity or running water in Uruguay... Maybe it’s selfish but I want these places to remain as untouched as possible. There’s always a conflict between wanting to spread the word/share a great story or an authentic experience and wanting to keep it under wraps. I like my secrets, so these days I share certain tips with friends only. 7. Finally, what is your favorite place and why? That’s a tough question. I like different places for different reasons and moods. For fading urban beauty and melancholy, Havana and Lisbon. For the sound of crickets at midday, the smell of lavender and sea salt, the islands of Croatia - I’ll selfishly keep the names of my favorites. :) For tuning out of the world and encounters with fascinating people, the beach community in Uruguay that I mention above. For the most beautiful night skies, the Altiplano of Bolivia. For tango and best evening breezes, Buenos Aires. I also loved Phnom Penh, Porto, Dominica... And I’m still in awe of New York, my base since 1999, even though it’s a love and hate kind of relationship. Hi Kimberly, glad you like Writer to Travel...will check out 'blog4reel' this weekend...sounds interesting.